The closest thing to a perfect fighting machine that the Decepticons have. As a warrior he has no equal; as a weapon he has no restraints. His actions result from seemingly savage, animal instinct. Can lift 500 tons; reacts to any movement he sees within .002 seconds. Can generate protective electric field. Wields powerful X-ray laser cannon. Each foot houses twinm mortar shell launchers. No known weaknesses. "Conquer the skies and what's below you will fall." He's like a kid at a candy store - always delighted by all the targets he has to choose from. Builds mecha-nests atop tall buildings and mountains; composed of late model sports cars, wings of jets, theater marquees. Back-mounted rocket thrusters allows speeds of 300mph, 2000 mile range. Can see a dime from 10,000 feet. Has particle-beam rifle with infra-red sight, and laser-guided sword. Magnetism inhibits flying ability. With fellow Predacons, forms Predaking. "The best advice is not to listen to advice." Doesn't listen to anyone, particularly his friends. Smug, arrogant. Puts up a stubborn front to hide deep-rooted insecurities. More vulnerable to psychological rather than physical attacks. In rhinoceros mode, his horn can puncture 3-foot thick steel, release corrosive acid. Uses plasma-sphere shooter that emits explosive energy balls; has light distorting diffraction sword. Combines with fellow Predacons to form Predaking. "Those who conquer, act; those who are conquered, think!" Barrels through life with an uncontrolled fury. Has difficulty talikng coherently for more than a few seconds before violently lashing out at anything near him, friend or foe. TV calms hims... stares at rock music videos for hours. As tiger, can leap 300ft. in height, 500ft. in length. A kick from his foreleg can crumble a cinder block well. As robot, carries 60,000 volt lightning rifle, 5000 degrees Farenheight thermo-sword. Combines with fellow Predacons to form Predaking. "Anger gets me running better than any other fuel." Prefers brute force over reason. Steam comes from his nasal ducts when he's enraged. Smashes head-first into highway trestles and small buildings to relieve his aggression. Always feels better afterwards. Carries 4 exterior fuel tanks, capacity: 1600 gallons, as a reserve for himself and his comrades. His horns shoot bolts of 20,000 volt electricity. Carries a catalytic carbine that shoots destructive chemicals, and an electro-sword. 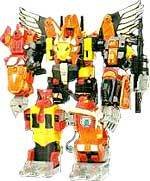 Combines with fellow Predacons to form Predaking.